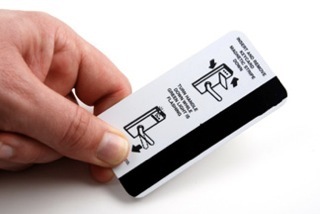 Ever wondered what’s on your magnetic key card? e. Customer's credit card number and expiry date! When you return them to the front desk your personal information is there for any employee to access by simply scanning the card in the hotel scanner. An employee can take a hand full of cards home and using a scanning device, access the information onto a laptop computer and go shopping at your expense. But until the card is rewritten for the next guest, its usually kept in a drawer at the front desk with YOUR INFORMATION ON IT! The bottom line is: Keep the cards, take them home with you or destroy them. NEVER leave them behind in the room or room wastebasket, and NEVER turn them into the front desk when you check out of a room. They will not charge you for the card (its illegal) and you'll be sure you are not leaving a lot of valuable personal information on it that could be easily lifted off with any simple scanning device card reader. If you have a small magnet, pass it across the magnetic strip several times. Then try it in the door, it will not work and it erases everything on the card. PLEASE FORWARD to friends and family .